Beautiful uncancelled certificate from the State Line Gold Mining Company No.4 issued in 1881. 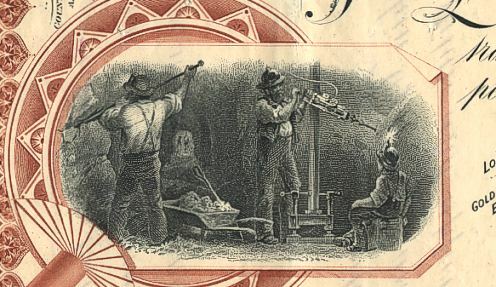 This historic document was printed by American Banknote Company and has an ornate border around it with two vignettes, one showing three miners at a shaft hoist with an ore bucket, the other of three miners underground; brown border. This item has the hand signatures of the Company's President, Lee. R. Shryock and Secretary, D. F. Yerdenal and is over 128 years old. Location of Mine, Gold Mountain District, Esmeralda County, Nevada printed on certificate.